You deserve a stay at Gulf Place Getaway! This comfy top floor beach condo unit is perfect for families, snowbirds, and anyone else who loves the gorgeous aqua-blue gulf waters. Tastefully appointed with everything you need to unwind, relax and soak up the lovely Gulf Place community on the Gulf of Mexico. Within 8 minutes drive of Destin - but worlds away from the Destin area crowds. Staying in this top floor beach condo affords gorgeous ocean views from your private extended balcony and ensures no footsteps from overhead. With a full working kitchen, updated master bed with KING size bed, the snug bunk room with adjacent 1/2 bath, and the cozy sleeper-sofa, this unit comfortably sleeps six. For those who just must stay plugged in, we do have free wireless internet as well. Private beach access is literally right across the neighborhood street, stroll past the pools and cross county road 30-A (speed limit - a relaxed 25 mph :) to enjoy the pristine, uncrowded beaches that keep everyone coming back to Gulf Place Beach Condos. Beach toys and chairs are available in our unit. Need some time out of the sun? Enjoy the convenience of the Gulf Place restaurants and shops or take a short drive to Destin, Seaside, Watercolor or Rosemary for even more shopping, good eats and family attractions. Or have fun playing on the 2 acre open park behind Gulf Place. Gulf Place shops include bike and kayak rentals, boutique shops, spa, restaurants and artists market. The Gulf Place tennis court, three pools, and golf nearby also provide some fun away from the beach. Call or email today to reserve your stay at Gulf Place Getaway - close to the fun & convenience of Destin & Seaside, with plenty of privacy and room to relax! Hi I'm Cathy, a wife and mother of three children. I'll coordinate your reservation for our unit at Gulf Place Cabanas # 410. On the map below our unit is located where County Road 30-A meets S. County 393. Since our first stay here, we dreamed of owning a little piece of the paradise that is Santa Rosa Beach. The beach is never crowded. The amenities are outstanding and well managed. We can completely unwind and relax here. We have three children who also love spending time here and we're happy to offer our Gulf Place Getaway for the enjoyment of other families looking for a truly quiet, relaxing, affordable beach vacation - close to the fun & convenience of Destin & Seaside, without the crowds. Three great pools - two heated, with hot tubs - and tennis courts. Views from the balcony of our 4th (top) floor unit feature amazing sunsets over the gorgeous Gulf of Mexico. Two private beach access points no more than 3 minutes from our entry door. Cute boutique shops, spa and restaurants right here in the Gulf Place Development. Watch the waves roll in and see how gentle the surf is from your balcony view. Occasionally you can see the dolphins swimming too! Several DVDs for all ages. The location of our unit provides one of three top floor extended balconies, with extra square footage to enjoy the cool breezes while you kick back and gaze at the ocean view. Just head down the elevator to the pool entry downstairs. We loved our stay at Gulf Place. Perfect place for a family vacation as beach toys and chairs were provided. It was close enough to everything we wanted to do, yet still far enough from too much tourist congestion. Lovely place and a very relaxing time for our family! We loved the room. It was perfect for a family of 4. My boys loved the little bunk room. Unlike most places with bunks, the bunks in this condo have doors on both sides that can be closed for privacy and a half bath in the room with the bunks. The rooms were clean and well appointed. The decor was perfect. We enjoyed the short walk to the beach. The pool at this particular building was much colder than the other building’s pool, so we walked over one building each day to use the pool, but that was a very short distance as well. The property has some good places to grab lunch. We ate at several and loved being so close to our room and the beach while being able to get a quick meal. The only downside to our stay was the elevator was broken for the first 3 days. That was tough with two littles and lots of beach equipment going up and down 4 flights of stairs several times a day. Apparently the building was struck by lightening the day before we arrived and the elevator was out of commission for 3 days. The owner was easy to get in touch with about the issue and very responsive and helpful. The lack of elevator was inconvenient, but unavoidable and had nothing to do with this particular condo or owner. We really loved the place and would definitely come back again. The condo was just the right size for us. The place was very clean and the bed was extremely comfortable. The balcony offered a lovely view of the gulf. We were able to rent bikes just steps from the condo and walk to good restaurants. We cycled to both state parks and hiked each day. We were able to cycle to Seaside and Black Bear bakery in Grayton Beach. It was a wonderful week. Cathy made everything very easy! Loved our stay at this great condo. Being on the top floor added those beautiful views. The condo was a perfect size for my son and I. The location is awesome- the private beach access a bonus. So nice that Cathy provides the beach chairs! We played tennis everyday, and biked, great vacation!! 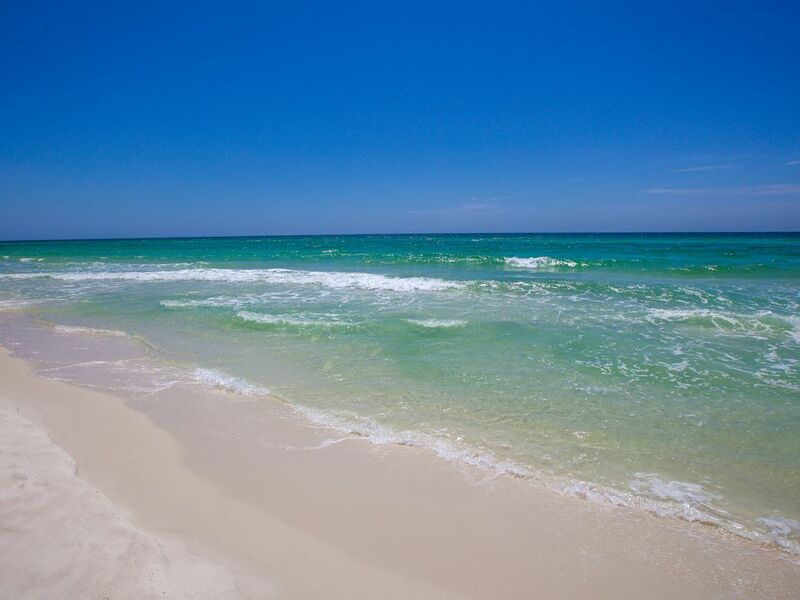 Mary - It's great to hear that you and your son had such a nice stay at our condo in Santa Rosa Beach. I appreciate you sharing your experience with future travelers! Keep us in mind for your next beach getaway. The view is what drew us in. The beds were comfortable. The location was great. We enjoyed the pool and hot tub at both condos. The decor and amenities were great. I’ll definitely be recommending this condo. This condo is perfect! Very cute and absolutely perfect walk to beach and shops. 10/10! So glad you enjoyed your stay Joan! Hope you'll visit our place again when you need some beach time. The Gulf Place development is unique, casual & fun. There are great little shops, a handful of terrific restaurants, a two acre grassy play area with concerts and other events. The beaches are breathtaking, clean and uncrowded with calm, emerald waters and sand that looks and feels like sugar! Enjoy the ocean view from this unit's extra large balcony.